This document will provide step-by-step guidance on how to export contact lists from Apple Contacts. Note: versions prior to 10.8 used address books instead of contacts. Important: If you are interested in exporting the auto-fill/auto-complete history from your Apple Mail program, please make sure to complete that step prior to exporting your contacts. The reason for this is Apple Mail cannot export auto-fill/auto-complete information, the export is completed by creating a new contact entry for previously email recipients/senders. Important: For those who use contact groups, please be aware that the individual contacts of your address book will be included in the export but your contact groups will not. If you use contact groups, please make a note of them prior to migrating so that you can more easily re-create them in Office 365. Select the contact list you would like to export (e.g., All Contacts). From the Contacts menu, select File, Export, then Export vCard... .
Give your file a descriptive name, then select the location where you would like to save it. 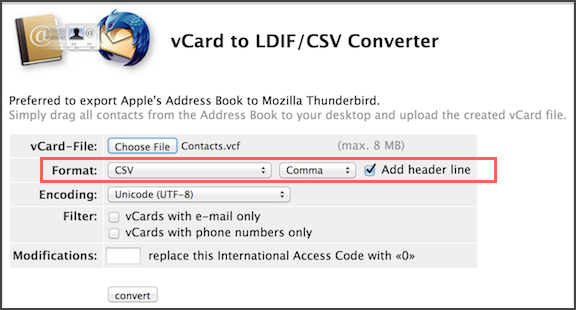 To convert the contacts' vCard to a Comma Separated Values (.csv) file, you will need to use a third-party converter. 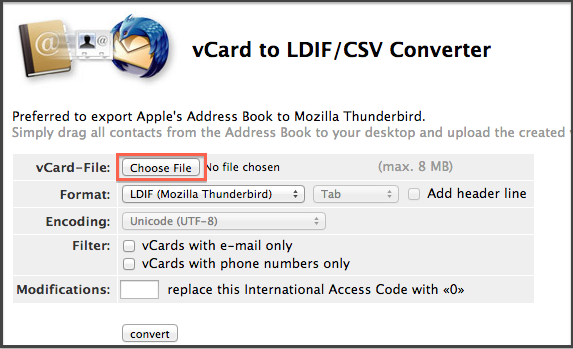 A similar online tool to the one demonstrated below can be found at: vCard to LDIF/CSV Converter . 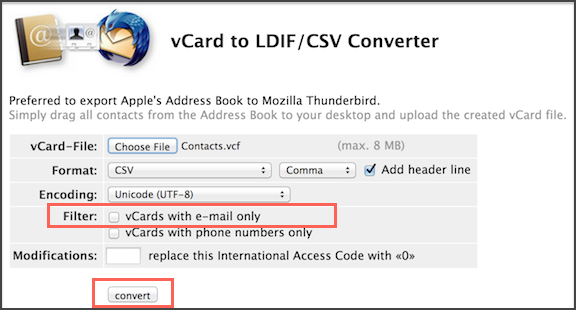 Using the converter, select the vCard file you saved in the previous step. For each of the two "Format:" drop down menus, select CSV and Comma, then check the Add header line box. Next to the "Filter:" field, uncheck the box labelled vCards with e-mail only. To finish the process, select convert to save the .csv file. Note: Your .csv file will be saved in the Downloads folder. You are now ready to import your exported Apple Contacts into your Office 365 account after you have transitioned to Office 365.